Mortgage Hedging – When Should I Hedge? A growing question in the mortgage industry is: “when should I think about mortgage hedging?” After all, for those with the capability to hedge, doing so should be a no-brainer. Properly hedging your pipeline mitigates risk and allows for the execution of trades on hedge products that allow you to make more money. And at the end of the day, who doesn’t want that? Often when considering mortgage hedging, though, you have to think about the barrier to entry, and if you’re ready to jump in or not. While there isn’t an exact number that you can point to as the right amount of money you should be seeing each month before hedging, there’s a pretty defined range that you can see if you fall into. Typically, lenders want to be on the higher side of between $12-15 million dollars in monthly hedgeable loans before considering mortgage hedging. And while being closer to $12 million can work, it’s typically best to wait until you’re at least trending toward the higher end of that range before diving in. But then, once you’ve evaluated how much money you’re seeing monthly in hedgeable loans, and you’ve decided that mortgage hedging is something you want to get into, what’s the next step? That’s where Mortech comes in. Mortech has partnered with providers like Mortgage Capital Trading (MCT) and, more recently, Resitrader to provide secondary marketing solutions for lenders looking to hedge and execute trades. Lenders can view Mortech data and pricing models directly from within the provider’s interface, allowing them to make knowledgeable and informed decisions before executing trades. Furthermore, Mortech streamlines the buying and selling process for lenders, speeding up the process and providing data and tools that allow for decisions to be made faster. 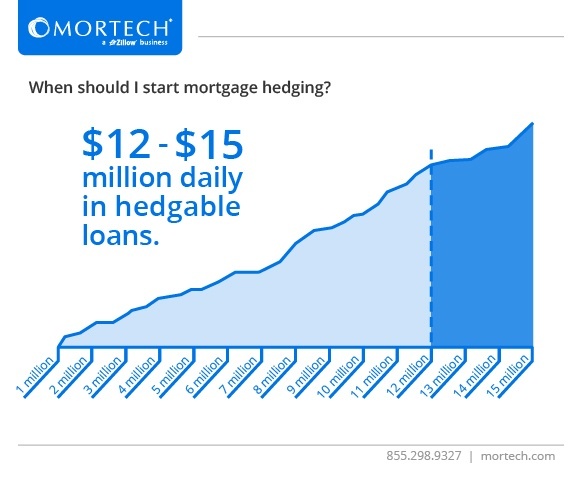 Mortech provides the means for you to begin mortgage hedging; all you have to do is figure out if it’s time for you to start. If mortgage hedging is something you want to look further into, or if you want to learn more about how Mortech can provide tools and data that streamline the buying and selling process on the secondary market, click the button below, and we’ll get in touch with you.